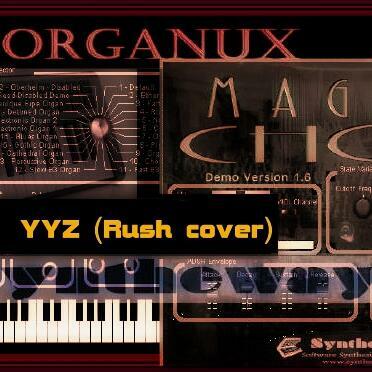 http://syntheway.net - YYZ, instrumental cover from Canadian rock band Rush made with Syntheway Organux Virtual Instrument plug-in. Note: In minute 2:45 to 3:10 a background of Magnus Choir is added. YYZ, Instrumental cover from Canadian rock band Rush (eighth studio album "Moving Pictures" ©1981). It is one of the band's most popular pieces and a staple of the band's live performances. The live album Exit...Stage Left (1981) and the concert video recording A Show of Hands (1989) both include versions in which Neil Peart incorporates a drum solo; as an interlude on the former, and as a segue out of the piece on the latter. Software Description: Organux is a virtual organ VST plug-in designed for creating a wide range of classic and modern organ sounds. "Organux" features a hybrid method that combines sampling and synthesis techniques. Windows Operating System : Windows XP, Windows Vista, Windows 7, Windows 8 / x86 (32 bit). For Windows x64 (64 bit) test it first with VST Bridge, jBridge or BitBridge. ........................................­........................................­.. Via Apple's Boot Camp software, included with Mac OS X v10.5 Leopard, v10.6 Snow Leopard and Mac OS X v10.7 Lion.